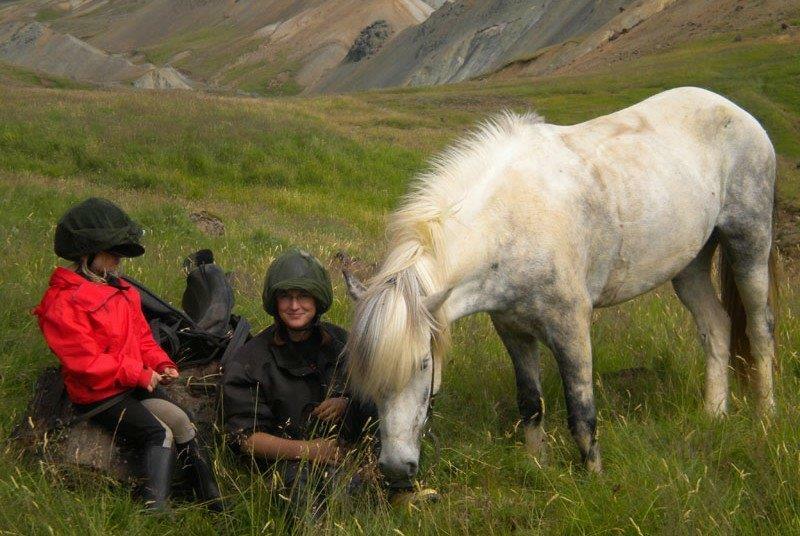 This tour offers spectacular views and a surprising variety of magnificent Icelandic nature. Duration: 9-10 hours with pickup. 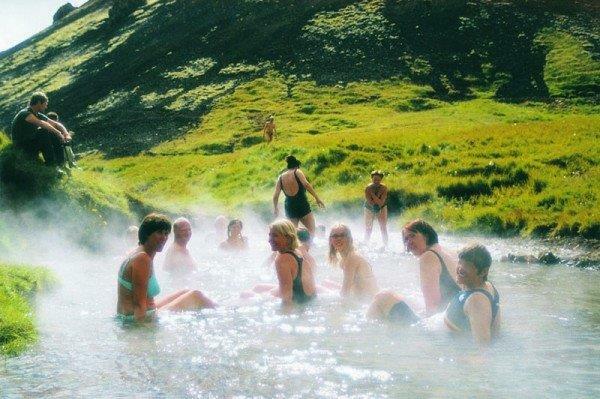 This tour offers spectacular views and a surprising variety of magnificent Icelandic nature. We first ride along the slopes of Reykjafjall mountain and continue on nice riding trails surrounding the small village Hveragerdi. The path then takes us through a green forest to a colorful geothermal valley with hot springs, an area which expanded dramatically during an earthquake in 2008. 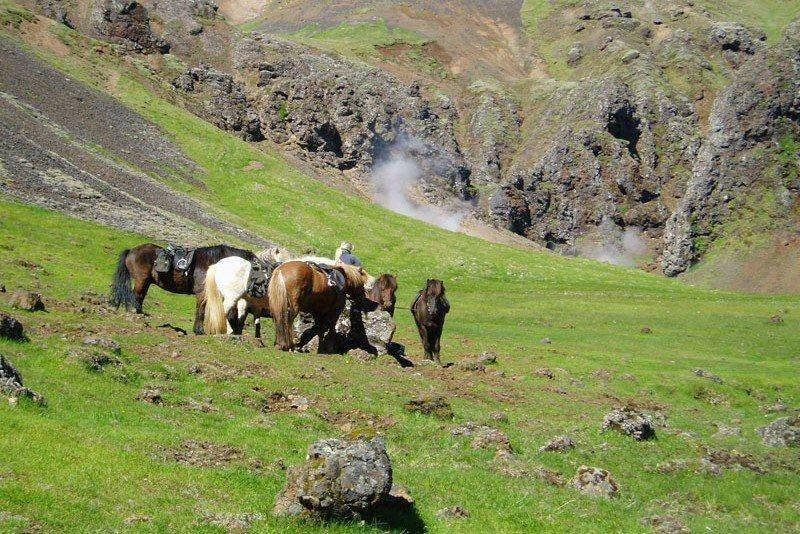 On our way towards the green hills surrounding the volcano Hengill, we have good opportunity to try the “tölt”, the special gait of the Icelandic horse. 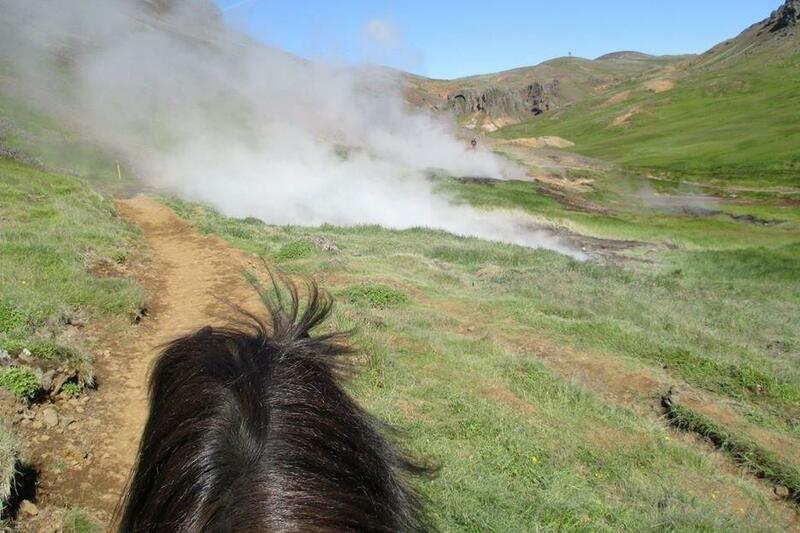 The horses then take us at a leisurely pace following narrow trails up into the valley Reykjadalur. We pass the beautiful waterfall Djúpagilsfoss and some hot springs before we reach Reykjadalur valley and will have the opportunity to take a relaxing bath in a warm stream. During the ride down the valley we enjoy fascinating panoramas over the surroundings, the village Hveragerdi, picturesque farmland and all the way down to the coastline, where we might see the Westman Islands, weather permitting. We continue along the mountain slopes again back to the farm, where coffee and home-baked cake are waiting for us. Bring your swimsuit and towel. This tour is for everyone but participants should be in good physical condition and must be able to mount a horse with little assistance. We ride quite a lot of “tölt” during this tour (about trot speed). The tour includes ca. 15 minutes hike uphill and downhill, due to weather conditions and regular maintenance of the trail the hiking time might be up to total ca. 45 minutes hike (back and forth). If the weather does not allow us to go into the mountains, the tour will be changed. There are no changing rooms in the valley. 5-6 hours riding with stops and bathing (ca. 19 km) and lunchbox (sandwich, cookies, water bottle, special sandwiches are available on request). Hotel pick-up in Reykjavik every day between 8:00 and 8:30. Return to Reykjavík ca. 17:15. This tour is available every day from May 20 to September 15, starting at our farm at 9:00.